A stunning and charming building, the Church of St. Francis of Assisi is located in Old Goa at a distance of some 10 kilometers from the capital city, Panaji. The Church of St. Francis of Assisi is at the same complex in which Se Cathedral is located. 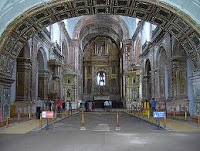 The Church of St. Francis of Assisi of Goa was built during 1517-1521 AD. St. Francis of Assissi Church of India has now been turned into a museum. An interesting fact about the church is that the architectural style of the church has a mix of Christian and Hindu elements. In 1521, the church was consecrated to the Holy Spirit but was demolished after some time. The church that is present here today was built in 1661. The entrance hall of the earlier church remained as it is. When the new church was built, there was also an educational institution within the church. However the institution was closed down by the Portuguese government sometime around 1835. In 1964, the Indian government converted the St. Francis of Assisi Church into a museum. Ancient relics and old paintings are now displayed here. The design and construction of the church is very intricate and much attention has been given to the details. Though in size, it is much smaller than Se Cathedral and the Basilica of Bom Jesus, the carvings and decoration is as striking as in those churches. The church is painted generously and the altars are carved beautifully. The interiors of the church are decorated with depictions from the Bible whereas the walls are carved with floral designs. The paintings in the church have a very distinctive Indian feel. There is a statue of St. Michael right at the entrance of the church. The congregation hall is heavily decorated with carvings and one finds two large statues of Jesus Christ and St. Francis of Assisi.